Christopher Bizilj, an eight year old from Ashford, Connecticut, died as a result of an Uzi sub-machine gun accidental shooting at the Machine Gun Show and Firearms Expo at the Westfield, Massachusetts Sportsman’s Club. Christopher’s father had given permission for his son to handle the gun prior to the incident. It is interesting to note that the father, Charles Bizilj, is the Director of Emergency Medicine at Johnson Memorial Hospital in Stafford, Connecticut. As such, it would appear that Dr. Bizilj has seen his fair share of gun shot wounds and injuries – both intentional and accidental type of shootings. While Christopher was shooting the Uzi, it recoiled, he lost control, and then accidentally shot himself in the head. This is a true tragic course of events for the Bizilj Family and all involved with the incident. The shooting shows the importance of gun safety and the dangers of putting a high powered weapon into the hands of an eight year old. Massachusetts is a comparative fault state when dealing with negligence cases. In other words, a victim and / or the victim’s family can collect compensation for injuries or death even if the victim or someone else was negligent as well. The amount of recovery or compensation is reduced by the amount of negligence on the part of a victim or a third party. 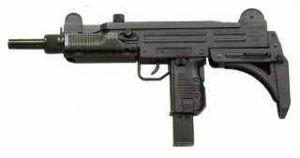 In this instance, it is arguable that the father was negligent in allowing his son to fire the Uzi; however, it would appear that the gun show promoters, organizers, and instructor had superior knowledge to that of Christopher and his father, who practices medicine but probably does not hold himself out as a firearms expert or instructor. The demonstration involving putting an Uzi in the hands of an eight year old put this child at unreasonable and unnecessary danger which in turn caused the untimely and tragic death of an eight year old boy. You can read more about this story at Boy Accidentally Shoots Himself with Uzi at Massachusetts Gun Show. Jacksonville Estate Planning Lawyer, David Goldman who writes the NFA Gun Trust Lawyer Blog has an analysis of the violations of the NFA that occur when a child is allowed to use a Machine Gun. David Goldman also suggests how a NFA Firearms Trust can provide asset protection for owners of Class 3 weapons and firearms in general. Whether a person, business or trust owns a gun, safety is key to protecting yourself, children, and anybody within firing distance of a gun.